Taking off for a beautiful tomorrow? Whatever your destination, let your hearts--and your guests' luggage fly--in the right direction. Our heartful airplane luggage tag maps the way to gratitude in a distinctly practical way. Keep one for yourself--you are taking luggage on your honeymoon, right? Features and facts: Shiny, silver-finish metal, airplane luggage tag with two windows, three hearts and a black-leather strap with a silver buckle. Identification card appears in protected window. 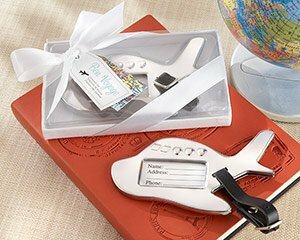 Luggage tag measures approximately 2 1/2" h x 4 1'4" w. Clear display gift box includes white base, a white-satin ribbon and bow, and two hang tags--one a colorful map and the other a color-coordinated "Bon Voyage" tag. Gift box measures approximately 3" h x 4 1/2" w x 3/4" d.